How To Conquer 30 Costly Mistakes & Multiply Your Wealth! For the past few years, investors have blamed practically everyone for their financial losses—greedy corporate executives, Wall Street analysts, stockbrokers, accountants, and the media. But an insightful new book by Lynnette Khalfani, former Wall Street Journal reporter for CNBC, challenges investors to take a hard look in the mirror and ask themselves whether they’ve also fallen victim to their own investing errors. 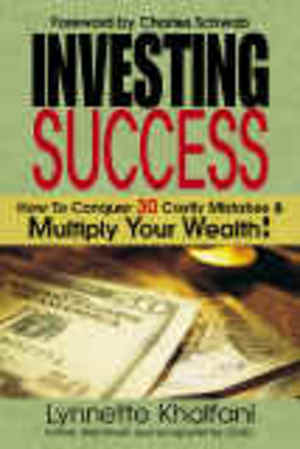 Investing Success: How To Conquer 30 Costly Mistakes & Multiply Your Wealth! begins with a foreword by Charles Schwab, and incorporates lessons from market legends such as billionaire Warren Buffett. The how-to investment guide also includes wisdom from dozens of financial experts, and personal accounts from every-day investors who candidly discuss their own investing miscalculations and what they learned from them.